The Ötillö SwimRun Hvar, Croatia, was our first SwimRun event. We were super excited! As marathon runners and triathletes this was a whole new game - at first we thought it may be a triathlon without the bike, but in training we found out that running in a wetsuit and sodden shoes and socks is way harder and a whole new challenge. But we took the challenge on, and entered 3 SwimRun events in 2017 - Hvar was the first event, so read on to find out more! The swimrun organisation Ötillö now holds 3 race distances at Swimrun Hvar. The shorter "Sprint" event is around 12km in total, with 4 swim legs. The longer World Series event is just over 40km in total, with 9 swim sections. When we did the Sprint event in 2017, it involved a 1000 meter swim out to one of the islands, some running on the island, then a swim back. 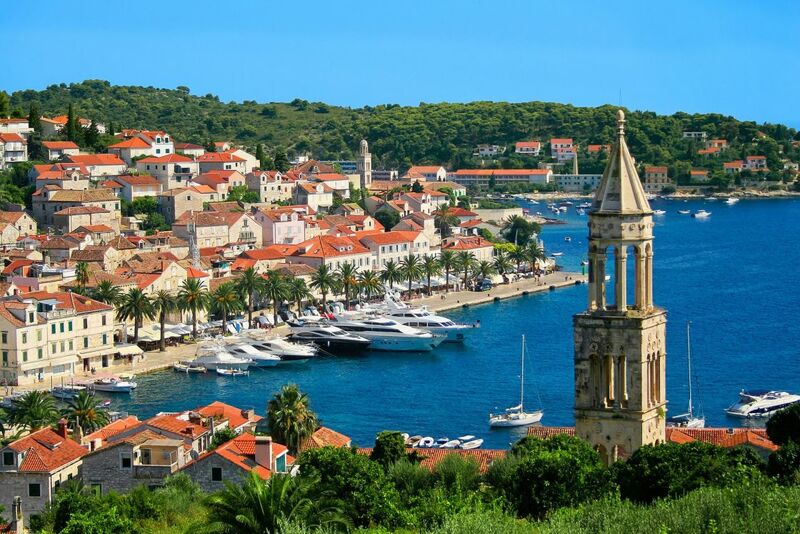 This has now been taken out of the event, and all running and swimming is on the main island of Hvar, with swimming limited to bays and shorelines. Total distance has also been reduced from 15 km to 11.8 km. The World Series event is a tough one, at a shade over 40 km. The longest swim leg is almost 3 km! (That's nearly 2 miles.) Teams will take from 5 to 7 hours to complete the race - if they can beat the cut-off times around the course. The NEW event for Ötillö is the "Experience" level race. This is shorter than the Sprint event, at 6.3 km, and is designed to allow people to have a go at swimrun, to see if they like it before taking on the challenge of all the training required for a longer distance. Also, they have decided to allow individuals to take part in the Experience and Sprint distances. This is slightly at odds with the declared definition of the sport (especially Ötillö events), which states that it is a team sport, where you compete as a team of 2 people. For me, competing as a couple is one of the things that makes swimrun unique and more enjoyable, as you share the race experience with your partner, and support each other during the whole race. BUT, I think it's a good way to introduce the sport to new people. OUR Swimrun Hvar RACE REPORT. It's hard to believe that Hvar SwimRun was ages ago now - it still feels like a few days! So, what was our first REAL Swimrun race like? There's no easy way to break this to you - it was TOUGH! But so much fun. 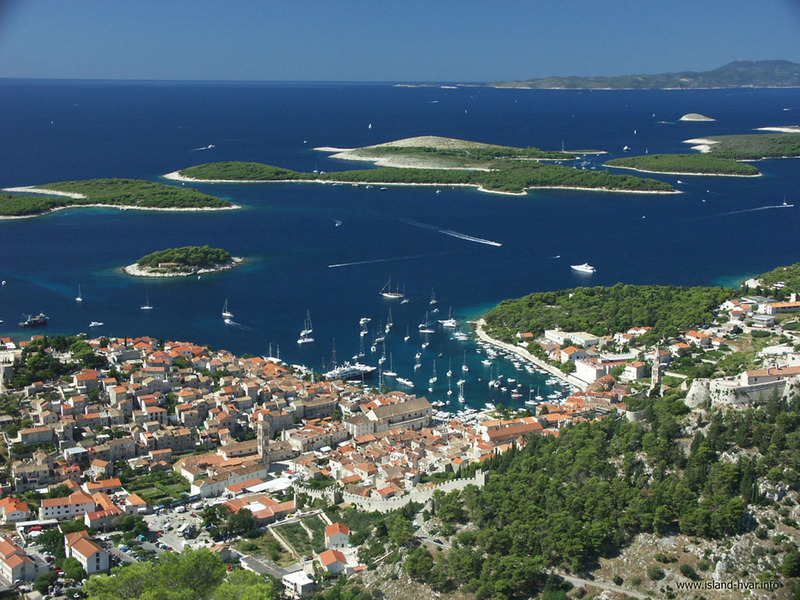 Hvar isn't easy to get to from Spain. We had to fly from Alicante to Barcelona, then on to Frankfurt in Germany, then another flight to Split in Croatia. And then a 1-hour bus transfer to the port in Split, to get onto the catamaran ferry to Hvar Town. A bit of a trek but well worth it, as we had not been to Croatia before, and we were looking forward to a new place to explore as well as the SwimRun race. It looked stunning, with crystal-clear waters, a pretty old town and of course islands to swim to. We found somewhere to stay on Airbnb very close to the start which was ideal - in fact it turned out to be perfect. We even had a view down a narrow street directly onto the finish line. Organised by the originators of SwimRun, ÖtillÖ, run by Michael Lemmel and Mats Skott, the weekend went off without a hitch. Our "Sprint" event was meant to be about 15km, but my TomTom gps watch recorded 18km. This was mostly due to a strong current flowing through the islands during the swim legs of the race, forcing us to swim at an angle to the current in order to reach the destination. Richard used his new Head Swimrun RACE wetsuit, while Mogsy had her Huub triathlon wetsuit. Having long legs on the suits gave us more buoyancy on the swims, but were rather warm on the long run. The long run (8km) was mostly a steep uphill trail on loose stones and through bushes and brambles. Most teams walked this section! Being the oldest couple in the race, we decided to start at the back. And on the first run of half a mile, we were indeed the last team as we approached the water for the first swim. But we quickly made up several places by simply not stopping to look down at the water when we got to the edge of the jetty - we simply carried on running and jumped in! On the first two legs, the swimrun tow rope is not allowed, and so we swam together at Mogsy's pace. Richard was fretting a bit that other teams might catch up, but when we got to the water exit, we found we had passed another 2 teams! On to the second run, about a mile, and we were passed by 2 younger teams on the way. The next swim entry was rocky, and we spent a minute attaching the tow rope and planning our direction across 1000 metres (one kilometer) of sea, with a strong current from left to right. Once into the water, the benefit of the tow-rope became obvious as we passed one team within minutes, two more halfway across, and another just before exiting the water. Richard did not feel he was being slowed down much by towing Mogsy, and neither did Mogsy feel she was being pulled much, but obviously we were reasonably quick! The exit onto the island was very rocky with razor-edged rocks; we helped each other get clear of the shore, and then started the slow run through bushes on a tricky little trail across the island. We were passed by several teams who were clearly better runners over rough terrain. We actually walked most of this section, as we were worried about falling on sharp rocks or twisting an ankle. After a short swim to a neighboring island and another short run, we came to the big swim back to the mainland. The wind had increased, and there was a BIG sea running. Nevertheless, we battled through some big waves, swallowing plenty of ocean on the way, and eventually made it back to dry land, having snagged 2 teams on the way. We thought the next run would be our strong point - it looked on the map like 8km (5 miles) of road. We flexed our marathon legs and set off at a decent pace, with no other teams visible in front nor behind. After stopping for a carbohydrate gel, we set off again, only find the path suddenly went left, uphill, into what I can only describe as a goat trail. It was steep, narrow, with sharp bushes either side and loose stones underfoot. Tough going! After about 10 minutes we were both feeling the heat, and stopped to take our wetsuit tops down to our waists. We already had our swim hats off. On we went, and gradually team after team went past us as we soldiered on. What we had expected to be our strong leg was turning out to be nothing special! The effort of running in a wetsuit is not to be underestimated. It's OK for the first hour or so, but after that the fatigue starts to build. We finally made the water stop, before starting the steep route back down, which would have been spectacular on a hike, but a little scary when running! We ended up running the last bit back to town with 2 other teams, and it boiled down to a last-swim shoot-out! 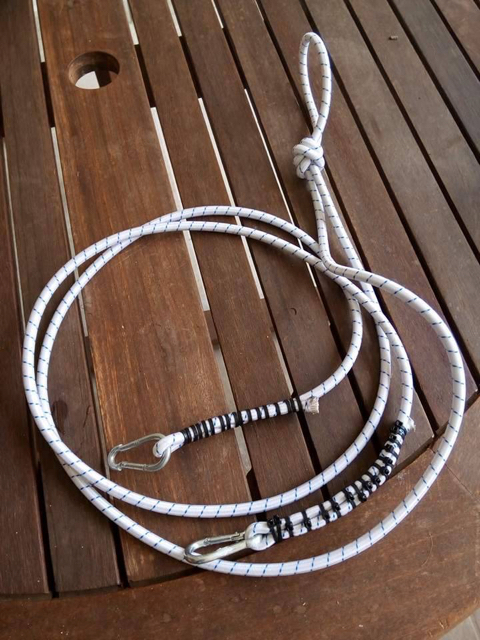 I was so tired I forgot that I had tied the tow rope round me, and tried to put my wetsuit back on over the tow rope! We lost about 3 minutes standing on the jetty at the water's edge trying to sort it out. The other 2 teams were already in the water. Finally sorted out, we jumped in feet first, and set out to try and recover the lost ground. We were both exhausted by this stage, but after the first hundred meters or so it became obvious that the other teams were feeling very tired too, and we slowly overhauled them before reaching the final water exit. Just half a mile to run to the finish! Could we keep ahead? We gave it the gun and ran as fast as our tired legs would allow, and held our position as we crossed the line, to be met by Race Director Michael Lemmel. Phew! Our final position was 12th out of 18 teams, so we were very pleased to have finished at all, and even better not last! What lessons did we learn from our first race? Overall, Swimrun Hvar was much harder than we expected, with the fatigue building slowly during the race. Each run was a little harder than the previous run, and each swim was a bit harder than the previous swim. Running in a wetsuit and swimming in run shoes is quite energy sapping as time moves on. We had hoped to finish in about 2 hours 20 minutes, but we actually needed 3 hours 34 minutes! A tough nut. But enjoyable. Regarding the swim pull cord, lead swimmer Richard didn't notice much difference but as the following swimmer Mogsy found it a bit hard to swim her normal stroke, as she was forever looking at where the cord was and trying to avoid it. She found her head was higher than usual and was sighting all the time, and not breathing to the side, as she was concentrating on keeping the cord aligned with the swim direction. We had bought some Gococo socks from the SwimRun shop, and were fantastic - no blisters nor chafing despite being wet for the whole race. We both needed more water to drink during the race, and we noticed that a lot of teams doing the longer event were carrying small blue water bladders that could be rolled up when empty, and re-filled at water stations. We will definitely get some for our next event in Engadin, Switerland! To sum up, Swimrun Hvar is a great place to hold a swimrun race. The only negative aspect is that it can be awkward to get to, depending where you are starting out from.